American Reporter | Reporting current events that are important to us all. May 13 (Bloomberg) — The World Health Organization is investigating a claim by an Australian researcher that the swine flu virus circling the globe may have been created as a result of human error. Adrian Gibbs, 75, who collaborated on research that led to the development of Roche Holding AG’s Tamiflu drug, said in an interview that he intends to publish a report suggesting the new strain may have accidentally evolved in eggs scientists use to grow viruses and drugmakers use to make vaccines. Gibbs said he came to his conclusion as part of an effort to trace the virus’s origins by analyzing its genetic blueprint. The World Health Organization received the study last weekend and is reviewing it, Keiji Fukuda, the agency’s assistant director-general of health security and environment, said in an interview May 11. Gibbs, who has studied germ evolution for four decades, is one of the first scientists to analyze the genetic makeup of the virus that was identified three weeks ago in Mexico and threatens to touch off the first flu pandemic since 1968. “The sooner we get to grips with where it’s come from, the safer things might become,” Gibbs said by phone from Canberra yesterday. “It could be a mistake” that occurred at a vaccine production facility or the virus could have jumped from a pig to another mammal or a bird before reaching humans, he said. Gibbs and two colleagues analyzed the publicly available sequences of hundreds of amino acids coded by each of the flu virus’s eight genes. He said he aims to submit his three-page paper today for publication in a medical journal. “You really want a very sober assessment” of the science behind the claim, Fukuda said May 11 at the WHO’s Geneva headquarters. The WHO’s collaborative influenza research centers, which includes the CDC, and sites in Memphis, Melbourne, London and Tokyo, were asked by the international health agency to review the study over the weekend, Fukuda said. The request was extended to scientists at the Food and Agriculture Organization in Rome, the World Organization for Animal Health in Paris, as well as the WHO’s influenza network, he said. Swine flu has infected 5,251 people in 30 countries so far, killing 61, according to WHO data. Scientists are trying to determine whether the virus will mutate and become more deadly if it spreads to the Southern Hemisphere and back. Flu pandemics occur when a strain of the disease to which few people have immunity evolves and spreads. In addition, Gibbs said his research found the rate of genetic mutation in the new virus was about three times faster than that of the most closely related viruses found in pigs, suggesting it evolved outside of swine. “Whatever speeded up the evolution of these genes happened at least seven or eight years ago, so one wonders, why hasn’t it been found?” Gibbs said today. ST. PAUL — In more than a dozen statehouses across the country, a small but growing group of lawmakers is pressing for state constitutional amendments that would outlaw a crucial element of the health care plans under discussion in Washington: the requirement that everyone buy insurance or pay a penalty. Approval of the measures, the lawmakers suggest, would set off a legal battle over the rights of states versus the reach of federal power — an issue that is, for some, central to the current health care debate but also one that has tentacles stretching into a broad range of other matters, including education and drug policy. Opponents of the measures and some constitutional scholars say the proposals are mostly symbolic, intended to send a message of political protest, and have little chance of succeeding in court over the long run. But they acknowledge the measures could create legal collisions that would be both costly and cause delays to health care changes, and could be a rallying point for opponents in the increasingly tense debate. “This does head us for a legal showdown,” said Christie Herrera, an official at the American Legislative Exchange Council, a group in Washington that advocates limited government and free markets, and which on Sept. 16 offered guidance to lawmakers in more than a dozen states during a conference call on the state amendments. Here in Minnesota, like in many of the other states, the move to amend the State Constitution is being driven by a handful of Republican lawmakers. The first efforts actually predate the Obama administration and the current federal health care debate. Proposed constitutional amendments began cropping up after 2006, when Massachusetts passed a sweeping state law meant to create nearly universal health coverage for residents. Elsewhere, some leaders — opposed to the possibility of insurance mandates, government-run systems or rules barring people from paying for their health care procedures — began suggesting constitutional amendments to block such measures from their own states. In Arizona, with help from Dr. Eric Novack — an orthopedic surgeon who says his intent was not “some grand secessionist plot” but merely a health care overhaul with protections for individuals’ rights — an amendment first went before voters in 2008. The idea lost, but by fewer than 9,000 votes among more than two million cast. This year, Arizona’s Legislature, dominated by Republicans in both chambers, voted to send the question back to the ballot in 2010. Few in the public seemed focused on health care a year ago, those involved in Arizona’s ballot question said, but the recent debate over a federal overhaul has changed all that, and proponents of the amendment believe that will improve its chances both in Arizona and in other states, where similar efforts have taken root. The federal proposals, though, have also changed the potential fallout if such amendments were to pass. Clint Bolick, litigation director at the Goldwater Institute, a conservative research group based in Arizona that favors free enterprise, and who has helped lead Arizona’s efforts, said he believed the inevitable “legal clash” — if the federal government adopts a health care law and if states change their constitutions — was winnable for the states. Although the Constitution’s supremacy clause ordinarily allows federal law to, in essence, trump a state law that conflicts with it, Mr. Bolick said that was not always the case, depending on “the strength of the state interest.” Mr. Bolick said he viewed two recentSupreme Court cases, related to an education question in Arizona and a utility district in Texas as indications that the current court might be open to such a state claim. But several other legal experts said they saw little room for such a challenge. “States can no more nullify a federal law like this than they could nullify the civil rights laws by adopting constitutional amendments,” said Timothy Stoltzfus Jost, a health law expert at Washington & Lee University School of Law. Even Randy E. Barnett, a Georgetown Law professor who has written about what he views as legitimate constitutional questions about health insurance mandates, seemed doubtful. “While using federal power to force individuals to buy private insurance raises serious constitutional questions, I just don’t see what these state resolutions add to the constitutional objections to this expansion of federal power,” Professor Barnett said. In Minnesota, even before the prospect of a court clash, Mr. Emmer appears to have an uphill battle ahead. 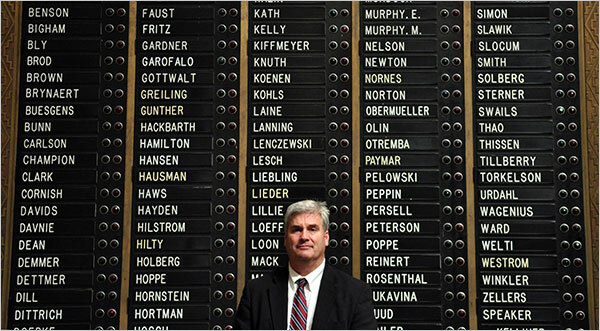 Before voters can consider amending the state’s constitution, Mr. Emmer needs approval from the Legislature, which is dominated by Democrats. He has offered the Health Care Freedom Act in years past, but it has never made its way to a vote, and Margaret Anderson Kelliher, the Democratic speaker of the House who is also among the wide field of candidates for governor, said last week that she doubted it stood much of a chance this time either. Still, Mr. Emmer, who is a candidate for governor, says he is hopeful. He emphasizes that such an amendment — regardless of court battles over a federal plan — would certainly spare Minnesotans from the potential downsides of some future state health care plan. And this whole amendment notion, he said, would not prevent anyone from taking part in a federal health program; it would merely block people from being forced to do so. Of legal experts who discount the states’ chances of trumping a federal plan, Mr. Emmer seemed unconvinced. Why Has the Terror Alert Level Not Been Raised? Why has the terror alert level not been raised recently? We have people in New York, Colorado, Texas, and Illinois trying to blow us up! Don’t get me wrong, I am so glad that the FBI is going a good job in catching these guys. I am just concerned because since Obama is in office there have been many more plots out there. I also wonder how many other plots are out there that we don’t know about? I hope that the whole CIA investigation that the Obama Administration is doing is not interfering with our ability to catch these plots. This MSNBC Reporter was so incredibly rude to Mrs. Taitz! She did not let her finish a thought ONCE in the entire conversation! Orly is just so soft spoken and he took advantage of that and was able to talk over her. He treated her like she was nothing but dirt; I commend her for going on that corrupt station to try and get the word out about this! The real reason that they had her on there was not to actually report the news, but it was to shine her in as bad a light as possible. They were reporting on the fact that the recent case was dismissed (in Georgia), but they did not mention the case that is coming up on January 26, 2010. They tried to hide that fact, but Mrs. Taitz was able to get that in… good for her! Keep up the good work Orly!!! Qaddafi Lauds Obama, Then Launches Into Rambling Attack on U.N.
NEW YORK — Libyan leader Muammar Qaddafi, declaring that “we’d be content and happy if Obama can stay president forever,” launched into a rambling assault against the United Nations Security Council on Wednesday, at one point complaining to world leaders gathered to hear him speak that he was tired and jet lagged. Qaddafi spoke after President Barack Obama’s first speech to the General Assembly. Referencing Obama as “my son,” Qaddafi said: “We are happy that a young African Kenyan was voted for and made president. Obama is a glimpse in the dark for the next four years, but I’m afraid we may go back to squar one. Secretary of State Hillary Rodham Clinton and U.S. Ambassador Susan Rice left the chamber before Qaddafi took the podium and left a low-level note taker to listen. Holding a copy of the United Nations Charter, Qaddafi said the U.N. was founded by the super powers and that now “small countries could be crushed by the super powers.” At one point, he motioned to rip up the small blue Charter booklet, but instead he paused and seemed to lose his place as world leaders and their representatives sat in stunned silence. He then continued to rail against the “inequality” of U.N. member states, often repeating himself while quoting from a section of the Charter that calls for equality of nations. He noted that five nations hold veto power on the Security Council and can block actions contrary to their interests: the United States, Russia, China, Britain and France. He later called for an African seat on the Security Council. As he fumbled through hand-written notes, he mixed his attacks with rambling references to: the Kennedy and King assassinations; the U.S. Civil War; the Korean War; the Suez War; Saddam Hussein’s hanging; former dictator Manuel Noriega; jet lag; and, a defense of the Taliban and Somali pirates. An Indonesian woman has given birth to an 8.7 kilogram (19.2 pound) baby boy – the heaviest newborn ever recorded in the country. The baby, who is still unnamed and is 62 centimetres long, was born by caesarean section Monday (local time) at a public hospital in North Sumatra province, a gynaecologist who took part in the operation said on Wednesday. “This heavy baby made the surgery really tough, especially the process of taking him out of his mum’s womb,” Binsar Sitanggang said. The boy’s massive size was likely the result of his mother, Ani, 41, having diabetes, Mr Sitanggang said. She had to be rushed to hospital due to complications with the pregnancy, which had reached nine months. The baby, her fourth, was the only child not delivered by a traditional midwife. Get A Daily Email of American Reporter's Top Stories! American Reporter · Reporting current events that are important to us all.